Presented in September this year iPhone X is the most advanced ever presented the “Apple” smartphones. Along with a new design, edge-to-edge display and a variety of other changes, jubilee, “iPhone” also got an innovative camera system TrueDepth, support for Slow Sync Flash, as well as a new dual main camera with improved sensors. In this article we will tell you what the new camera iPhone X and how they work. TrueDepth is an innovative camera systems iPhone X, including 7-megapixel front camera, an infrared camera, the projector pixels and the infrared emitter. Let’s see what are the functions of each of the components TrueDepth. The projector points projected onto the user’s face more than 30 000 invisible dots to create his card. In the future, this high-precision map is used to authenticate the owner of the iPhone X.
Infrared camera reads the pixel structure of the user’s face and creates based on the obtained data, the image in the infrared spectrum that is sent to a special module of the Secure Enclave built into the processor A11 Bionic. In the Secure Enclave module compares the user’s face with the previously saved map. It is important to note that the comparison is done in a special way. A fragment of the neural core microprocessor A11 Bionic converts the infrared image and the depth map into a mathematical representation which is compared with the registered data of the person. The infrared emitter is responsible for the ability of face recognition of the owner of the iPhone X in all conditions, even in the dark. The emitter directs the user’s face, a beam of infrared light, also invisible. In addition to unlock the smartphone and pay for goods in digital stores with the help of sight, the system TrueDepth can be used in several other situations. When you make a photo with the front camera, iPhone X also uses the system by TrueDepth, allowing you to get better selfies, even in difficult shooting conditions. TrueDepth system uses various sensors to determine the exact relief of the face and collects data in three dimensions. With this data, you will be able to more effectively use third-party applications, impose on your face a variety of masks and filters. For example, the app Snapchat, you can choose different masks that will move the same as moving your face, and change depending on your emotions. iPhone X features dual camera with a resolution of 12 MP, which consists of a module with a conventional lens module with wide angle lens (telephoto). 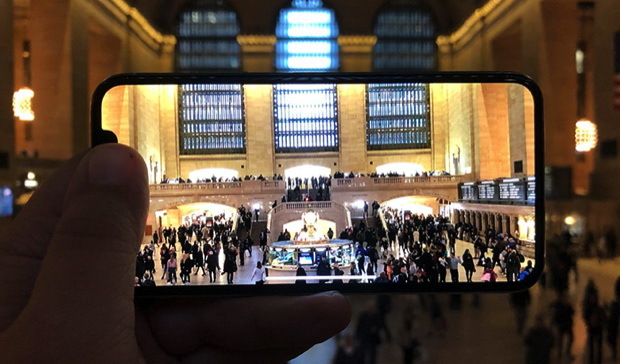 Unlike the cameras in the iPhone 8 and 8 Plus, the iPhone uses other X matrix, which provides even higher quality photos and videos. The main 12-megapixel camera with a conventional lens got a lens aperture of f/1.8, which is enough for most situations, including night photography. 12-megapikselnaja the camera now offers a fast lens with an aperture of f/2.4, while the iPhone 8 Plus aperture equal to f/2.8. The second main novelty is the presence of television cameras with optical image stabilization, which is clearly lacking in the iPhone 7 Plus and the iPhone 8 Plus. Now the two approaching not only the quality is lost (due to the smaller amount of noise), but also significantly decreased the risk of blurred pictures. It is the presence of the optical stabilizer simultaneously in two PV modules was the reason that Apple turned the camera from horizontal to vertical. Another innovation in the iPhone X has been support for shooting smooth, high-definition video at 4K resolution. Now users can shoot video in 4K at framerate from 24 frames to 60 frames/sec. Moreover, slow motion video Slow-mo now spelled in Full HD 1080p at up to 240 fps. The front camera can record video in 1080p at 30 K/sec. For recording videos, Apple has come up with a new standard called HEVK, through which the manufacturer was able to reduce the final file size with constant quality. At the presentation of iPhone X Apple mentioned that the smartphone has a new technology shooting Slow Sync Flash, which allows photos taken in dark time of day will be better. First, let’s look at what a Slow Sync (literally “slow sync”). Actually this is not new technology and it for several years is used by other smartphone manufacturers. Each camera has a shutter between the lens and sensor. Most of the time it is closed. His work can be compared to century, which covers the human eye and is opened only to pass necessary to create a photo light. By default the camera and shoot with a high shutter speed. Such a short “session” of work allows you to “freeze” the motion in the picture and as a result makes the photo more clear. At low shutter speeds it is the opposite – the longer it remains open, light is more, the movement is not “frozen”. The main drawback of shooting in this mode is that due to the movement of objects or hand shake of the photographer pictures may be blurred. However, if you know what output you can get a really interesting photo. If desired, you can set the shutter so that it was not closed for hours, and “absorbed” every part of the world, and all their work combined into a single image. This technique is used when photographing a starry sky. But what if we add to this a flash? There are two basic methods of synchronization with flash: front curtain and rear curtain. For example, the shutter opens for 0.5 seconds. Front curtain sync triggers the flash immediately after the shutter opens and keeps it open for a half second. The rear opens the shutter for half a second, and the flash includes in the moments before the shutter closes. Now add exposure. This setting determines how light or dark the. If the night not to use flash (for example, for landscape shooting), the camera can properly expose the background. But if in the foreground you will have a person or subject, the exposure will be incorrect or too dark. In order to see the person or object in the foreground, you have to turn on the flash. In turn, the camera will adjust the exposure so that after you disable the flash the subject in the foreground was not peresechen. The problem with such a traditional technique of using flash is that the whole image becomes darker, and as a result the background is not visible at all any details. If the iPhone camera is X “knows” that in the picture she is going to use the flash, it first will darken the exposure. The shutter opens but never closes in the blink of an eye, as it was before. The flash turns off before closing the shutter, thereby “freezing” the image. Since the shutter was open for an extended period of time, it collects more light and sends it to the background. In result the background becomes brighter. Because the shutter has gathered more light with a person (or object) in the foreground, the flash on to illuminate it “to the maximum” – i.e. it may be not so bright. Because of this, the person or object in the foreground will not be too “overexposed” as it could be before. X iPhone is the first Apple smartphone with truly “smart” camera. Thanks to the new modules and technologies TrueDepth and Slow Sync Flash photos taken with the X Phone, in most cases, are clear, sharp and high quality. An important innovation in iPhone X was also capture smooth high-definition video in 4K resolution. Users can now shoot 4K videos with Framatom from 24 to 60 frames/sec. New Apple smartphone makes the best pictures with flash in Apple’s history, so if you like to take pictures in the dark, this is another argument to buy new items. Did you like how the iPhone takes X? Share with us in the comments! You are reading an article on the What iPhone camera X. All materials on the site Gadgets F, а также и статья What iPhone camera X - written for the purpose of information enrichment and we are happy if you like our magazine.